Our second son is a qualified furniture/cabinet maker with a local business. In his spare time he is kept busy making various items for people. 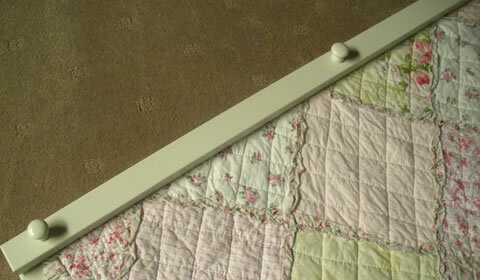 He was approached by a local retail outlet to make some white compression quilt hangers, which he has done. There are many wood stained hangers out there but those with shabby chic quilts might be interested in these Antique white ones he has made. They are a simple design which goes with today's minimilistic type style. Here are a couple of pics, one with the different sizes and one just to show how the quilt is held. The compression quilt hanger is designed to hang your quilt, wall hanging or tapestry firmly across the width of the hanger. The material is held securely between 2 pieces of timber that are compressed together by tightening the knobs. Your quilt will not come into contact with the screw thread of the knob, ensuring that your quilt is not damaged. 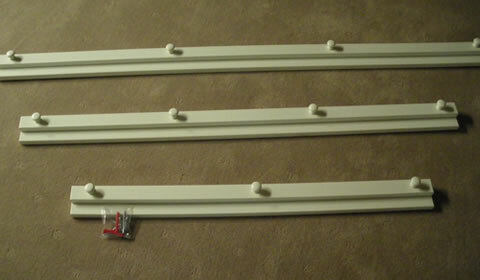 The back piece gets screwed to the wall with screws and fittings that are supplied with the hanger. The screws will not be seen. 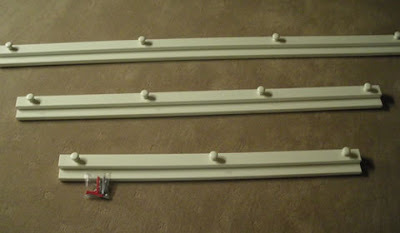 The quilt hangers come in three sizes, 900mm, 1200mm and 1500mm and there are 3 x 60mm screws, 3 x 50mm wall plugs for brick walls and 3 wall mates for gyprock walls also included. If you are interested just email me and I'll provide more details. They are available to Australian residents only. In the November edition of Notebook magazine there was instructions to make a cushion cover with a shirt-front. It's super easy. I wanted to use the shirt-front as the back for my cushion as I had a nice piece of fabric that I wanted to turn into a cushion for our guest room. Simply find a shirt that complements the colour of the front of your cushion. Cut the shirt-front to size. Place right sides together and sew all the way around. This is the great part, because all you do is undo the buttons to turn it the right way out and place the cushion insert inside. Whalla a new cushion cover! I have seen one on a blog with a pretty white ruffled shirt which was used for the front of the cushion but I couldn't find it to show you. The quilt hangers look great, quite different from the usual dowel and wire ones you see around. Great idea isn't it? I think it would be worth finding a few shirts at thrift shops in various colours just to make cushions with! So easy. The hangers are a great idea. Your cushion is wonderful. Great idea to use up the shirt buttons and all. Isn't that a great idea. I just love recycling.